I know these are from the 90s and they are really nice overall. Regardless they are pretty cool. 13 Different Guns, Pistols, Rifles, Firearms. All are in good condition. Buildable camo weapon crate opens for weapons storage. Invincible is unbeatable when you build your REQ station and boost your translucent Spartan’s defenses using armor based on the Overshield Power-Up! Deflect any attack with the Overshield Power-Up! Buildable Overshield REQ station opens for weapons storage. Release: Set #97521 - Hierarch's Shadow Convoy. Covenant Elite Honor Guard. Accessories: All accessories displayed in the picture(s) are included. Condition: Used. This service. MEGA Bloks HALO 5 Covenant Brute Lance Pack DPJ89. Condition is New. May have some light shelf wear but is new and sealed. Includes two weapons crates with an arsenal of authentic weapons for customization. 2016 MEGA CONSTRUX HALO BRUTE WEAPONS CUSTOMIZER PACK 57 PCS. DXR57 VHTF !! DXR57 VERY HARD TO FIND ! 144 PIECES DYH88. FIRETEAM OSIRIS. ITEM IS MINT IS SEALED BOX NEW MINT SHAPE. CASE FRESH. Release: Set #DPJ89 - Covenant Brute Lance. Condition: Like new. This service. HALO MEGA BLOKS WARTHOG RESISTANCE 97011 COLLECTORS SERIES SEALED. Release: Weapon Crates (2018). Call of Duty Weapon Crate Set. This service. UNSC Weapons Crate. Accessories: All accessories displayed in the picture(s) are included. Condition: Used. This service. This auction is for one new Call of Duty Sniper Weapon Crate Set from the Mega Construx. It is brand new. Shipping and Tracking are free. I accept Paypal. I do not accept returns unless I listed an item in error. Sorry, no international orders on this auction. Be sure to view my other great listings and save on postage if you are a multiple winner. Please e-mail me with any questions and happy bidding. New ListingMega Bloks Soldier With Guns Halo? The photos show the actual item you are getting. Covenant Weapons Crate. This service. Covenant Elite Commando. Condition: Like new. Accessories: All accessories displayed in the picture(s) are included. This service. This auction is for one new Call of Duty Close Quarters Weapon Crate Set from the Mega Construx. It is brand new. Shipping and Tracking are free. I accept Paypal. I do not accept returns unless I listed an item in error. Sorry, no international orders on this auction. Be sure to view my other great listings and save on postage if you are a multiple winner. Please e-mail me with any questions and happy bidding. Accessories: All accessories displayed in the picture(s) are included. Condition: Used. This service. UNSC Small Weapons Crate. This service. 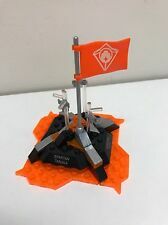 Halo Mega Construx Stormbound Elite Honor Guard Sealed in Package. Condition is New. Shipped with USPS First Class Package. This service. Accessories: All accessories displayed in the picture(s) are included. Condition: Used. Mega Bloks Pirates Carribean Fire Ice Krystal Wars Minifigures Weapons Lot Of 17. Condition is Used. Complete figures. Not broken. Nice used condition. Pet and smoke free home. Covenant Brute. Condition: Like new. This service. New Mega Bloks HALO 97011 UNSC WARTHOG RESISTANCE Factory Sealed master chief . Condition is New. Shipped with USPS First Class Package. My response time is usually the same hour/day. The item will be posted via Usps courier ASAP after payment is received, usually within one working day. I will package the item securely and will provide the buyer with a tracking number once I have dispatched it. Please if there is a problem when you receive your order, email me and I will do my very best to fix it. Customer service is what I strive for. Thank you for viewing my auction and have a great day!